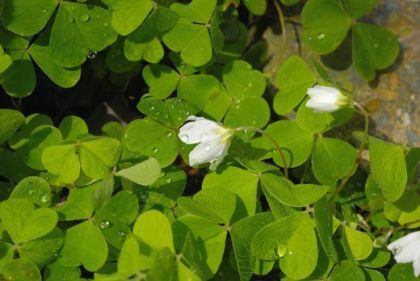 Wood-sorrel is not easily confused with other wild plants on this web site. Carpeting old, undisturbed woodlands in spring, this pretty downy perennial also grows on moss-covered trees and shady walls and is widespread throughout the country. 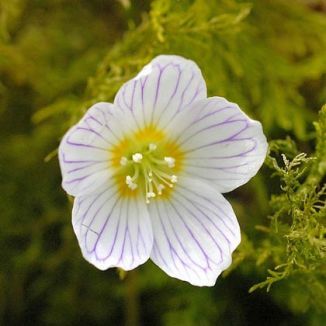 Each pretty white five-petalled bell-shaped flower (10 - 15 mm) is held solitarily on a stem which comes directly from the roots. The petals are lined with a tracery of pink veins through to the golden centre of the flower. The leaves are trifoliate, each leaflet heart-shaped and these fold up towards late afternoon or in rain as do the fragile flowers. They have a sharp taste of oxalic acid. This flower blooms from April to June, is a native plant and belongs to the family Oxalidaceae. I first identified this wildflower at Laragh in Co Wicklow in 1977 and photographed it there 30 years later. Also known as Wood Shamrock and Wood Sour, the leaves of this plant were used to make an ointment by early herbalists. Some people eat these leaves in salads or soups but beware, as large doses may cause oxalate poisoning.